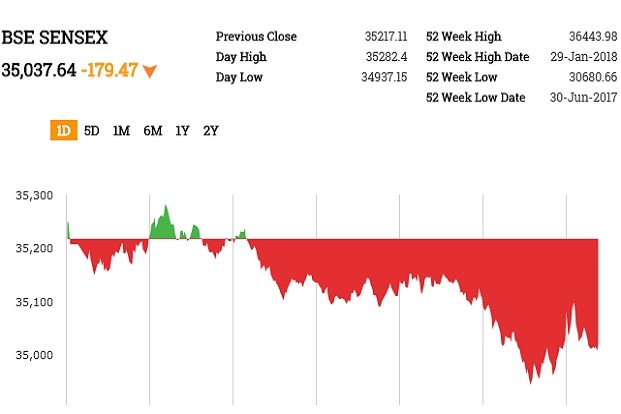 3.33 pm ISTClosing bell: Sensex, Nifty fall for 2nd dayBSE Sensex closed lower by 179.47 points, or 0.51%, to 35,037.64, while the Nifty 50 fell 82.30 points, or 0.77%, to close at 10,589.10. BSE MidCap and SmallCap, however, shed 1.62% and 1.50%, respectively.All the sectoral indices on BSE, except metal and telecom, declined with oil and gas, consumer durables, energy and realty losing over 2%.Mahindra, NTPC, Bharti Airtel and Kotak Bank were among the top gainers, whereas ICICI, Tata Motors, HPCL and Tech Mahindra were among the major losers. 3.03 pm ISTAdani Ports buys 97% stake in Marine Infrastructure DeveloperAdani Ports and SEZ Ltd said that it has signed a share purchase agreement to buy a 97% stake of Marine Infrastructure Developer Pvt. Ltd. Adani Ports shares were down 0.66% at Rs362.30. 2.38 pm ISTMarket update: Sensex, Nifty fall nearly 1%BSE Sensex traded lower by 235.23 points, or 0.67%, to 34,981.88, while the Nifty 50 fell 106.90 points, or 1%, to 10,564.50. 12.57 pm ISTIDBI Bank revises home loan slabIDBI Bank has revised its home loan slab from existing Rs30 lakh to Rs35 lakhs, effective 18 June, in line with new home loan PSL norms issued by RBI. The bank now offers interest rate of 8.5% pa for housing loans up to Rs35 lakhs. 12.08 pm ISTRBL Bank buys remaining stake in Swadhaar FinserveRBL Bank Ltd said that it has acquired an additional 39.52% stake in Swadhaar Finserve Pvt. Ltd, increasing its total holding to 100%. Swadhaar Finserve provides comprehensive financial services and products, particularly loans and savings products, to low-income households and microenterprises across India. RBL Bank shares rose 0.59% to Rs547.90. 11.35 am ISTMarket update: Sensex, Nifty trade lowerBSE Sensex traded lower by 92.08 points, or 0.26%, to 35,125.03, while the Nifty 50 fell 35.85 points, or 0.34%, to 10,635.55. BSE MidCap and SmallCap fell 0.61% and 0.83%, respectively.Fifteen out of 19 sectoral indices on BSE declined with realty, consumer durables, energy and power losing most. IT, teck, metal and auto gained. M&M, Infosys, ONGC and HDFC Bank were among the top gainers, whereas Coal India, ICICI Bank, Power Grid and HDFC were major losers. 11.25 am ISTIndian Bank withdraws dividendShares of Indian Bank fell 2.10% to Rs340.20 after the bank said it has decided to cancel a dividend payment of Rs6 previously announced. 10.25 am ISTMarket update: Sensex, Nifty trade flatBSE Sensex traded higher by 10.47 points, or 0.03%, to 35,227.58, while the Nifty 50 fell 8.30 points, or 0.08%, to 10,663.10. 9.40 am ISTTata Steel shares rise over 1%Tata Steel Ltd shares rose 1.10% to Rs549.20 after Reuters reported that the company and Thyssenkrupp AG are nearing a €15 billion ($17.4 billion) deal this week to combine their European assets into a global steel giant. Tata Steel Europe’s labour representatives are also close to approving the deal, added the report. 9.25 am ISTShares of OMC, aviation and tyre companies fall as oil prices riseShares of Oil marketing companies, aviation and tyre companies fell after international crude oil prices spiked further. Hindustan Petroleum Corp Ltd fell 5%, Bharat Petroleum Corp Ltd declined 5%, Indian Oil Corp Ltd 4%. Among Aviation companies, Jet Airways India Ltd slipped 2%, SpiceJet Ltd 2.2%, Indigo 1.1%. Among Tyre stocks, MRF Ltd fell 0.2%, Apollo Tyres Ltd 3%, JK Tyre & Industries Ltd 2.2%. 9.18 am ISTMarket update: Sensex, Nifty open lowerBSE Sensex traded lower by 21.87 points, or 0.06%, to 35,195.24, while the Nifty 50 fell 19.95 points, or 0.19%, to 10,651.45. 8.45 am ISTOpening bell: Cues to look out for before trading today■ US stocks closed lower on selling in shares of financials and technology companies. S&P 500 was down 0.86% at 2,699. Asian markets opened lower on growing worries about trade war fears.■ The board of India’s insurance regulator—Insurance Regulatory and Development Authority of India, or IRDA—will meet on Friday to discuss a possible easing of rules to facilitate IDBI Bank sale to Life Insurance Corporation of India (LIC), reports Mint, citing two people aware of the development.■ ICICI Bank Ltd issued hundreds of letters of credit (LCs) to entities related to its troubled corporate borrowers to help them avoid loan default, a whistleblower complaint said, pre-empting the need to set aside money for non-performing assets (NPAs), reports Mint.■ Thyssenkrupp AG and Tata Steel Ltd are nearing a €15 billion ($17.4 billion) deal this week to combine their European assets into a global steel giant, reports Reuters.■ State Bank of India (SBI) has closed six foreign branches and is in the process of closing down another nine branches as part of rationalisation of overseas operations, reports PTI.■ HCL Technologies Ltd will be acquiring Wolfsburg-based H&D International Group for Euro 30 million, as it looks to expand presence in the European market, reports Business Standard.■ JSW Steel Ltd announced plans to invest Rs7,500 crore until March 2020 to increase the production capacity at its Vijayanagar facility in Karnataka to 13 million tonnes per annum, reports PTI.■ Puranik Builders Ltd, a major real estate developer with projects in Mumbai and Pune, on Wednesday filed the draft prospectus for its initial public offering (IPO), which will see the company raise Rs810 crore.